Guidi was banned from Naples because of his liberal views in 1799. His property was confiscated. He became a general in the revolutionary army that fought against queen Caroline. He was caught and almost executed, but the English intervened on his behalf. He went to France, where he became a Professor of Mathematics in Lyon and Marseille. In 1820 he became a Doctor of Medicine at Strassbourg. After his wife was cured by Dr. de Romani from Napels he studied homeopathy and introduced it in France in 1830. Subsequently he practiced homeopathy in France until his death in 1863. 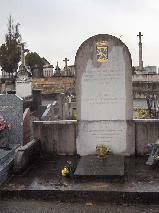 The grave of Sébastien Gaeten-Salvador Des Guidi at the Loyasse cimetière, Lyon.